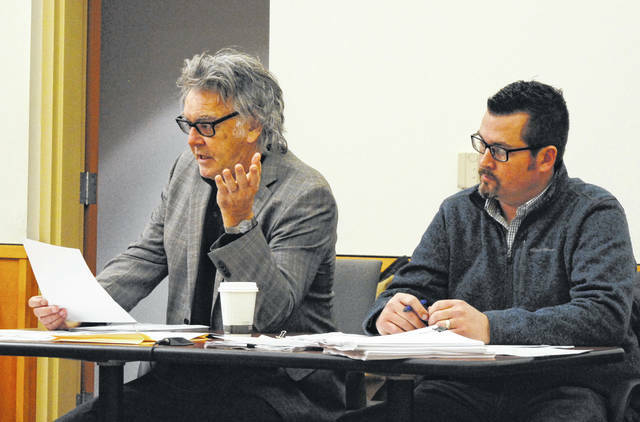 Hillsboro Mayor Drew Hastings, left, speaks to Hillsboro City Council Monday night. At left is Safety and Service Director Mel McKenzie. Hillsboro City Council on Monday approved a $5.1 million budget for 2019, delayed two months by negotiations between the city and the Paint Creek Joint EMS/Fire District for real estate and fire coverage. In the safety and service director’s report at council’s monthly meeting, Mel McKenzie explained the budgeting process for the city and said department heads had to cut more than $800,000 in various funds from a projected budget submitted to the state last year. McKenzie last week confirmed that while a final deal has not been signed, an informal agreement is being reviewed by lawyers and is expected to be approved soon. In turn, the city will pay Paint Creek $650,000 over each of the next three years for fire and EMS coverage under contract, then will become a member of the district in the fourth year. When and if it does, an automatic 5.5-mill levy will be put in place. During McKenzie’s report, the safety and service director defended the city’s 1.5-percent income tax, which some have said should be repealed if the city joins the fire district. According to McKenzie, residents opposed to the city joining the fire district have said the income tax, originally approved in 1978 to pay for the Hillsboro rescue squad, would essentially be a “double tax” if the city joins and the levy is put in place. But McKenzie said the income tax was amended in 1986 to cover other general expenses, and revenue from the tax now accounts for 82 percent of the city’s General Fund. McKenzie said it would be “detrimental” if the tax was repealed or reduced. In other business, Hillsboro Police Chief Darrin Goudy issued a commendation for Patrol Officer Andrew Gosink, who Goudy said was recently able to stop an attempted suicide. Hastings jabbed at Hillsboro Auditor Gary Lewis for not attending meetings and said he hopes council “demands a far higher standard for reporting” from the next city auditor. Lewis was not in attendance. Hastings said there is a receptionist job opening at the administration office. Interested parties can contact the city at 937-393-5219. The mayor also said a number of people have contacted him unhappy about a new Dollar General store opening on South High Street near the high school. As long as there are no ordinances restricting those types of businesses, he said, they are free to build and operate in the city. “Steps can be taken to address commercial building, but citizens need to be involved for that to happen,” he said. In the Hillsboro Planning Commission report, Hastings said the group met Jan. 22 and discussed the city’s Imagine Hillsboro master plan, re-elected Tom Eichinger chairman and Charlie Guarino vice chair, denied a request for conditional use zoning on West Pleasant Street and approved a sign variance. In the Finance Committee report, Chairman Justin Harsha said his committee met twice last week to finalize the budget. Councilwoman Ann Morris, who sits on the committee, requested the group discuss more revenue sources for the city, and Harsha placed the matter in his committee. The Finance Committee also recently met with the Utilities Committee to discuss water rates and storm sewers, according to Utilities Chairman Brandon Leeth. Council excused the absence of Council President Lee Koogler and Councilwoman Wendy Culbreath. Harsha stood in for Koogler as council president pro tempore. Council also entered executive session for about a half an hour to discuss a security issue and purchase or sale of property. After the executive session, council approved a resolution authorizing the city’s community improvement corporation to retain funds for future property acquisition. Harsha declined to comment on what property might be purchased. In other business, council suspended the three-reading rule and approved an ordinance establishing a tax increment financing district and heard a first reading adding a $3 base fee to residents’ water bills.